Hello, and welcome to Sub Rosa magazine, a new concept in alternative media. Sub Rosa is a full magazine, in PDF form, which is available online for free. This 'new paradigm' magazine also includes video and audio content, as well as live linking to topical websites. Anywhere in the magazine that you see a clapperboard icon, you can click and access related video content. Likewise, if you see a headphone icon, you can click to hear the audio. URL buttons indicate live links. We offer Sub Rosa freely in good faith - if you enjoy the magazine, please take the time to make a small donation via the Paypal button on the right of the page - if everyone contributed a small amount, our future would be assured. Issue 6 is the latest release of Sub Rosa, and it's once again packed full of fascinating content. We have an exclusive interview with 'alternative Egyptologist' Robert Bauval on his new book The Egypt Code and related topics. We also have a fascinating article from Blair Blake on his addiction to collecting rare books by Aleister Crowley - a vice which he passed on to his good friend Danny Carey, the drummer for TOOL. Mitch Horowitz profiles the mysterious Manly P. Hall for us, and don't miss the article on how psychics seem to have predicted the 'Miracle of Fatima' of 1917. 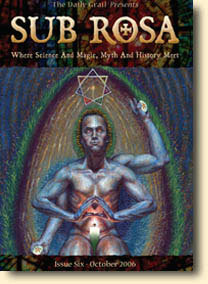 We review Bauval's The Egypt Code, a new book on Timothy Leary titled I Have America Surrounded, the Fatima trilogy of books related to the article in this issue, and Gary A. David's The Orion Zone.Lastly, we're privileged to publish a special news report on Robert Schoch and Colette Dowell's investigation of the alleged Bosnian Pyramid. As usual, we also have columns from Ian Lawton, Michael Grosso and Greg Taylor, the latest news in the alternative scene, and a look ahead in our 'Crystal Ball' section. The latest issue of Sub Rosa is available from the Download link, in both a single-page version as well as a double-page spread version (previous issues will also remain available). I recommend the double-page version to see the magazine as it was meant to be. However, the choice is yours. Please take the time to sign up for the email notification as well, so you are sure of knowing when future issues are released. I also recommend that you save the magazine PDF to your computer and view it in Acrobat, rather than viewing it in the constricted space of your browser window (Acrobat also allows you to view it in full screen mode, which I think is the best possible way to view the magazine). See the Help page for tips on viewing the magazine. We welcome any feedback you have on Sub Rosa, and also invite you to check out our daily news site The Daily Grail (some of you probably already do). We also look forward to hearing from anyone wishing to advertise in the magazine and help support this exciting new project - see our Advertising page for more information about Sub Rosa and our current rate card. Please download the magazine, check it out, and tell your friends.